Živi mrtvaci (eng. The Walking Dead) je američka televizijska serija koju je kreirao Frank Darabont. Temeljena je na seriji istoimenih stripova čiji su autori Robert Kirkman, Tony Moore i Charlie Adlard. Andrew Lincoln pojavljuje se u glavnoj ulozi kao zamjenik šerifa Rick Grimes koji se nakon ranjavanja budi iz kome i nađe u apokaliptičnom svijetu kojim dominiraju zombiji, a koje preživjeli nazivaju "šetačima". Ubrzo Rick krene u potragu za svojom obitelji, a putem nailazi na mnogobrojne preživjele. * ↑ Ime ovog/ove glumca/glumice ne pojavljuje se na uvodnoj špici filma već mu/joj se ime pojavljuje nakon iste, ali televizijska mreža AMC ga/ju svejedno smatra redovnim članom glumačke postave. ↑ "rick grimes". AMC. http://www.amctv.com/shows/the-walking-dead/cast/rick-grimes. pristupljeno 29. ožujka 2012.. "a small-town sheriff's deputy"
↑ 2,0 2,1 "The Walking Dead Premieres Halloween; Comic-Con Trailer Now Online". AMC. 24. kolovoza 2010.. http://blogs.amctv.com/the-walking-dead/2010/08/premiere-comic-con-trailer-video.php. pristupljeno 24. kolovoza 2010..
↑ 3,0 3,1 "FOX International Channels (FIC) and AMC Announce a Global Launch for the Highly Anticipated TV Drama Series The Walking Dead". Fox International Channels. 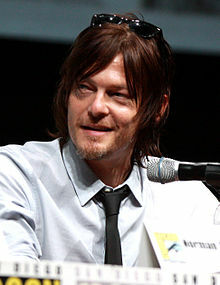 24. kolovoza 2010.. http://www.foxinternationalchannels.com/about/press/fox-international-channels-%28fic%29-and-amc-announce-a-global-launch-for-the-highly-anticipated-tv-drama-series,-the-walking-dead. pristupljeno 25. srpnja 2011..
↑ 4,0 4,1 "AMC Resurrects 'The Walking Dead' for a Second Season". AMC. 8. studenog 2010.. http://www.thefutoncritic.com/news/2010/11/08/amc-resurrects-the-walking-dead-for-a-second-season-639014/20101108amc01/. pristupljeno 8. studenog 2010..
↑ Webb Mitovich, Matt (22. srpnja 2011.). "The Walking Dead Reveals Season 2 Premiere Date, Creepy-Good New Trailer". TVLine. http://www.tvline.com/2011/07/walking-dead-season-2-premiere-date/. pristupljeno 22. srpnja 2011..
↑ 6,0 6,1 "'The Walking Dead' Renewed For A Third Season By AMC". TV by the Numbers. 25. listopada 2011.. http://tvbythenumbers.zap2it.com/2011/10/25/the-walking-dead-renewed-for-a-third-season-by-amc/108444/. pristupljeno 25. listopada 2011..
↑ 7,0 7,1 7,2 Harnick, Chris (21. prosinca 2012.). "'The Walking Dead' Season 4: AMC, Glen Mazzara Part Ways For New Season". The Huffington Post. http://www.huffingtonpost.com/2012/12/21/the-walking-dead-season-4-glen-mazzara_n_2346734.html. pristupljeno 21. prosinca 2012..
↑ 8,0 8,1 Ausiello, Michael (29. listopada 2013.). "The Walking Dead Renewed for Season 5, Scott Gimple to Return as Showrunner". TVLine. http://tvline.com/2013/10/29/the-walking-dead-season-5-renewal-2014/. pristupljeno 29. listopada 2013..
↑ 9,0 9,1 9,2 Swift, Andy (25. srpnja 2014.). "The Walking Dead @ Comic-Con: Season 5 Premiere Date Revealed — Watch Explosive First Trailer". TVLine. http://tvline.com/2014/07/25/walking-dead-season-5-premiere-date/. pristupljeno 25. srpnja 2014..
↑ 10,0 10,1 Abrams, Natalie (7. listopada 2014.). "'The Walking Dead' renewed for season 6". Entertainment Weekly. http://insidetv.ew.com/2014/10/07/walking-dead-renewed-season6-amc/. pristupljeno 7. listopada 2014..
↑ 11,0 11,1 "The Walking Dead: Season 1". Metacritic. http://www.metacritic.com/tv/the-walking-dead/season-1. pristupljeno 9. prosinca 2010..
↑ 12,0 12,1 "The Walking Dead: Season 2". Metacritic. http://www.metacritic.com/tv/the-walking-dead/season-2. pristupljeno 14. listopada 2011..
↑ 13,0 13,1 "AMC Garners Six WGA Award Nominations for Acclaimed Original Dramas "Mad Men," "Breaking Bad" and "The Walking Dead"". AMC. 8. prosinca 2010.. http://www.thefutoncritic.com/news/2010/12/08/amc-garners-six-wga-award-nominations-for-acclaimed-original-dramas-mad-men-breaking-bad-and-the-walking-dead-712414/20101208amc01/. pristupljeno 9. prosinca 2010..
↑ 14,0 14,1 Reiher, Andrea (14. prosinca 2010.). "2011 Golden Globes nominations: 'Glee,' '30 Rock' lead TV nominations". Zap2it. http://blog.zap2it.com/frominsidethebox/2010/12/2011-golden-globes-nominations-glee-30-rock-lead-tv-nominations.html. pristupljeno 14. prosinca 2010..
↑ 15,0 15,1 Bibel, Sara (13. listopada 2014.). "'The Walking Dead' Season 5 Premiere Hits Series High Ratings in Adults 18-49 & Viewers". TV by the Numbers. http://tvbythenumbers.zap2it.com/2014/10/13/the-walking-dead-season-5-premiere-hits-series-highs-in-adults-18-49-viewers/313670/. pristupljeno 13. listopada 2014..
↑ Melrose, Kevin (10. lipnja 2014.). "‘The Walking Dead’ producers hope to keep the show alive through Season 12". HitFix. http://www.hitfix.com/news/the-walking-dead-producers-have-story-plans-through-season-12. pristupljeno 13. lipnja 2014..
↑ 17,0 17,1 17,2 Patten, Dominic (31. ožujka 2014.). "AMC's 'Walking Dead' Adds Trio As Season 5 Regulars". Deadline.com. http://www.deadline.com/2014/03/amc-walking-dead-adds-trio-season-5-series-regulars-adam-j-west-alanna-masterson-christian-serratos/. pristupljeno 31. ožujka 2014..
↑ 18,0 18,1 Goldberg, Lesley (31. ožujka 2014.). "'Walking Dead' Promotes Trio to Series Regulars for Season 5". http://www.hollywoodreporter.com/live-feed/walking-dead-season-5-andrew-692170. pristupljeno 1. travnja 2014..
↑ 19,0 19,1 Andreeva, Nellie (5. svibnja 2014.). "Seth Gilliam Joins ‘The Walking Dead’ As New Regular". Deadline.com. http://www.deadline.com/2014/05/seth-gilliam-the-walking-dead-cast-series-regular/. pristupljeno 5. svibnja 2014..
↑ Ausiello, Michael (4. travnja 2013.). "Melissa McBride Clears Up Walking Dead Contract Mystery, Declares: 'I Am a Series Regular'". TVLine. http://tvline.com/2013/04/04/walking-dead-melissa-mcbride-series-regular/. pristupljeno 4. travnja 2013..
↑ Goldberg, Lesley (3. travnja 2013.). "'Walking Dead' Promotes Three to Series Regular for Season 4". The Hollywood Reporter. http://www.hollywoodreporter.com/live-feed/walking-dead-season-4-spoilers-tyreese-beth-sasha-432869. pristupljeno 4. travnja 2013..
↑ Goldberg, Lesley (26. travnja 2013.). "'Walking Dead' Adds 'Wire' Vet to Play Pivotal Comic Character for Season 4". The Hollywood Reporter. http://www.hollywoodreporter.com/live-feed/walking-dead-season-4-larry-gilliard-bob-444688. pristupljeno 27. travnja 2013..
↑ Alexander, Bryan (20. rujna 2010.). "Thomas Jane Yearns To Be One of 'The Walking Dead'". NBC Washington. http://www.nbcwashington.com/blogs/popcornbiz/Thomas-Jane-Yearns-To-Be-One-of-the-Walking-Dead-101781763.html. pristupljeno 13. prosinca 2010..
↑ Molloy, Tim (27. srpnja 2011.). ""Walking Dead" Gets a New Showrunner". http://www.reuters.com/article/2011/07/27/idUS112639320820110727. pristupljeno 23. studenog 2012..
↑ Marnell, Blair (5. siječnja 2012.). "Being Human' Star Slams AMC Over Aborted 'Walking Dead' Web Series". Crave Online. http://www.craveonline.com/tv/articles/180707-being-human-star-slams-amc-over-aborted-walking-dead-web-series. pristupljeno 1. travnja 2012..
↑ Melrose, Kevin (2012-01-05). "Being Human Star Reveals Aborted Plans for Walking Dead Web Series". Spinoff Online. Pristupljeno 2012-04-03. ↑ Melrose, Kevin (2012-01-09). "Darabont Had a Different Opening for The Walking Dead Season 2". Spinoff Online. Pristupljeno 2012-04-03. ↑ Otto, Jeff (6. srpnja 2010.). "'The Walking Dead' Set Visit Preview: The Bloodiest Show Ever!". Bloody Disgusting. http://www.bloody-disgusting.com/news/20803. pristupljeno 2. studenog 2010..
↑ Goldman, Eric (20. siječnja 2010.). "AMC Orders Walking Dead Pilot". TV IGN. http://tv.ign.com/articles/106/1062319p1.html. pristupljeno 11. lipnja 2010..
↑ Sauriol, Patrick (25. siječnja 2010.). "Exclusive: A review of the pilot script for The Walking Dead TV series". Corona Coming Attractions. http://www.coronacomingattractions.com/news/exclusive-review-pilot-script-walking-dead-tv-series. ↑ Miska, Brad (10. veljače 2010.). "TV: 'The Walking Dead' Pilot to Begin Lensing in May". Bloody Disgusting. http://www.bloody-disgusting.com/news/19047. pristupljeno 7. lipnja 2011..
↑ Seidman, Robert (29. ožujka 2010.). ""The Walking Dead Lives on AMC;" Network Greenlights Series Based On Comic Books". TV by the Numbers. http://tvbythenumbers.zap2it.com/2010/03/29/the-walking-dead-lives-on-amc-network-greenlights-series-based-on-comic-books/46517. pristupljeno 11. lipnja 2010..
↑ Chan, Jon (2. lipnja 2010.). "Walking Dead TV Series Starts Filming!". Secondary Fire. Arhivirano iz originala July 16, 2011. http://web.archive.org/web/20110716030025/http://www.secondary-fire.com/walking-dead-tv-series-starts-filming. pristupljeno 11. lipnja 2010..
↑ Barton, Steve (14. lipnja 2010.). "The Walking Dead: Frank Darabont Only Directing the Pilot?". [Dread Central. http://www.dreadcentral.com/news/37997/the-walking-dead-frank-darabont-only-directing-pilot. pristupljeno 15. lipnja 2010..
↑ Ross, Dalton (27. kolovoza 2014.). "'The Walking Dead' first look: Seth Gilliam as Father Gabriel Stokes". Entertainment Weekly. http://insidetv.ew.com/2014/08/27/walking-dead-father-gabriel-stokes-seth-gilliam-first-look/. pristupljeno 8. listopada 2014..
↑ "EXCLUSIVE!! Learn Who Writes And Directs All The Season-One Episodes of Frank Darabont's AMC Zombie Series THE WALKING DEAD!!". Ain't It Cool News. 17. srpnja 2010.. http://www.aintitcool.com/node/45801. pristupljeno 18. srpnja 2010..
↑ Andreeva, Nellie (1. prosinca 2010.). "'The Walking Dead' Lets Go Of Writers; Considers No Writing Staff For Season 2". Deadline.com. http://www.deadline.com/2010/12/the-walking-dead-lets-go-of-writers-considers-no-writing-staff-for-season-2/. pristupljeno 3. prosinca 2010..
↑ 38,0 38,1 Bryant, Adam (2. prosinca 2010.). "The Walking Dead's Robert Kirkman: Writing Staff Changes Won't Affect the Show". TV Guide. http://www.tvguide.com/News/Walking-Dead-Writing-Staff-1026363.aspx. pristupljeno 3. prosinca 2010..
↑ Collis, Clark (3. prosinca 2010.). "'Walking Dead' exclusive: Exec producer Gale Anne Hurd denies Frank Darabont fired writers, talks season two". Entertainment Weekly. http://insidetv.ew.com/2010/12/03/walking-dead-darabont-hurd-writers/. pristupljeno 4. prosinca 2010..
↑ 40,0 40,1 Andreeva, Nellie (26. srpnja 2011.). "'WALKING DEAD' SHOCKER: Frank Darabont Steps Down As Showrunner". Deadline.com. http://www.deadline.com/2011/07/walking-dead-shocker-frank-darabont-steps-down-as-showrunner/. pristupljeno 27. srpnja 2011..
↑ Andreeva, Nellie (27. srpnja 2011.). "Glen Mazzara to Succeed Frank Darabont as 'Walking Dead' Showrunner". Deadline.com. http://www.deadline.com/2011/07/glen-mazzara-to-succeed-frank-darabont-as-walking-dead-showrunner/. pristupljeno 27. srpnja 2011..
↑ Goldberg, Lesley (14. siječnja 2013.). "Scott Gimple Tapped as New 'Walking Dead' Showrunner". The Hollywood Reporter. http://www.hollywoodreporter.com/live-feed/walking-dead-showrunner-scott-gimple-glen-mazzara-406144. pristupljeno 14. siječnja 2013..
↑ Goldberg, Lesley (12. ožujka 2013.). "'Walking Dead' Adds Pair to Writers Room for Season 4". The Hollywood Reporter. http://www.hollywoodreporter.com/live-feed/walking-dead-adds-pair-writers-427611. pristupljeno 14. ožujka 2013..
↑ 45,0 45,1 Warner, Kara (4. studenog 2010.). "Inside Bear McCreary's 'The Walking Dead' Theme: Making Music Out Of 'Nothing'". MTV. http://splashpage.mtv.com/2010/11/04/bear-mccreary-the-walking-dead-theme/. pristupljeno 22. veljače 2012..
↑ "The Walking Dead (AMC's Original Soundtrack - Vol. 1)". Amazon.com. http://www.amazon.com/dp/B00BPLDCVM. pristupljeno 11. rujna 2014..
↑ "The Walking Dead — AMC Original Soundtrack, Vol. 2". Amazon.com. http://www.amazon.com/dp/B00IOS475O/. pristupljeno 11. rujna 2014..
↑ "The Walking Dead AMC Original Soundtrack – Volume 2 Now Available". AMC. 27. kolovoza 2013.. http://blogs.amctv.com/the-walking-dead/2013/08/the-walking-dead-soundtrack-vol-2/. pristupljeno 11. rujna 2014..
↑ Bibel, Sara (24. srpnja 2014.). "'Songs of Survival Volume 2' Available With 'The Walking Dead' Season Four DVD Set". TV by the Numbers. http://tvbythenumbers.zap2it.com/2014/07/24/songs-of-survival-volume-2-available-with-the-walking-dead-season-four-dvd-set/286223/. pristupljeno 11. rujna 2014..
↑ Ayers, Mike (12. listopada 2012.). "What it takes to make a 'Walking Dead' zombie". CNN. http://www.cnn.com/2012/10/12/showbiz/tv/walking-dead-zombies-greg-nicotero. pristupljeno 13. srpnja 2013..
↑ "Walking Dead Locations". walkingdeadlocations.com. http://walkingdeadlocations.com/. pristupljeno 19. studenog 2012..
↑ "Exclusive: The Walking Dead Set Visit Preview: Oh Yes, There Will Be Blood!". Dread Central. 5. srpnja 2010.. http://www.dreadcentral.com/news/38367/exclusive-the-walking-dead-set-visit-preview-oh-yes-there-will-be-blood. pristupljeno 2. studenog 2010..
↑ "The Walking Dead – About the Show". AMC. http://www.amctv.com/shows/the-walking-dead/about. pristupljeno 9. listopada 2010..
↑ Hibberd, James (25. listopada 2010.). "'Walking Dead' plans global zombie invasion stunt". The Hollywood Reporter. http://www.hollywoodreporter.com/blogs/live-feed/walking-dead-plans-global-zombie-32345. pristupljeno 4. studenog 2010..
↑ Neuman, Clayton (20. srpnja 2010.). "The Walking Dead Motion Comic Arrives Online". AMC. http://blogs.amctv.com/the-walking-dead/2010/07/the-walking-dead-motion-comic-video.php. pristupljeno 18. listopada 2010..
↑ Neuman, Clayton (11. listopada 2010.). "The Making of The Walking Dead Documentary". AMC. http://blogs.amctv.com/the-walking-dead/2010/10/video-making-of-the-walking-dead.php. pristupljeno 18. listopada 2010..
↑ Keck, William (15. lipnja 2011.). "Keck's Exclusives: Walking Dead Ready for Action". TV Guide. http://www.tvguide.com/News/Kecks-Exclusives-Walking-1034245.aspx. pristupljeno 15. lipnja 2011..
↑ Miska, Brad (13. srpnja 2010.). "SD Comic-Con 2010: The Walking Dead Promotional One-Sheet". Dread Central. http://www.dreadcentral.com/news/38495/sd-comic-con-2010-the-walking-dead-promotional-one-sheet. pristupljeno 13. srpnja 2010..
↑ "Episode 1 – Days Gone By". tvb.com. http://programme.tvb.com/drama/thewalkingdead/episode/1. pristupljeno 31. kolovoza 2011..
↑ Ernesto (21. listopada 2010.). "The Walking Dead TV-Series Premieres On BitTorrent". TorrentFreak. http://torrentfreak.com/the-walking-dead-tv-series-premieres-on-bittorrent-101021/. pristupljeno 22. listopada 2010..
↑ Fernandez, Joe (14. lipnja 2010.). "FX signs global broadcast rights to The Walking Dead". Marketing Week. http://www.marketingweek.co.uk/news/fx-signs-global-broadcast-rights-to-the-walking-dead/3014580.article. pristupljeno 19. prosinca 2011..
↑ "The Walking Dead Season 5 Premieres Worldwide Just 24 Hours After US Broadcast". Fox International Channels. 26. srpnja 2014.. http://foxinternationalchannels.com/press/the-walking-dead-season-5-premieres-worldwide-just-24-hours-after-us-broadcast. pristupljeno 6. prosinca 2014..
↑ "FOX International Channels Rolls Out First-Ever Global Brand Strategy on 126 FOX Channels with Return of Global Hit Series ‘The Walking Dead’". Fox International Channels. 21. siječnja 2015.. http://foxinternationalchannels.com/press/fox-international-channels-rolls-out-first-ever-global-brand-strategy-on-126-fox-channels-with-return-of-global-hit-series-the-walking-dead. pristupljeno F17. veljače 2015..
↑ "The Walking Dead Season 1 DVDs Now Available for Pre-Order". AMC. 2. prosinca 2010.. http://blogs.amctv.com/the-walking-dead/2010/12/season-1-dvd-blu-ray-pre-order.php. pristupljeno 6. prosinca 2010..
↑ Lacy, Gord (21. srpnja 2011.). "The Walking Dead – Press Release for Season 1 Special Edition". TVShowsOnDVD.com. http://www.tvshowsondvd.com/news/Walking-Dead-season-1-special-edition/15688. pristupljeno 21. srpnja 2011..
↑ "Walking Dead, The (Comparison: European Version (e.g. UK BD) – US Version)". Movie-Censorship.com. http://www.movie-censorship.com/report.php?ID=949636. pristupljeno 1. kolovoza 2011..
↑ "Walking Dead, The (Comparison: European Version (e.g. UK BD) – US Version)". Movie-Censorship.com. http://www.movie-censorship.com/report.php?ID=669769. pristupljeno 22. kolovoza 2011..
↑ "Walking Dead, The (Comparison: European Version (e.g. UK BD) – US Version)". Movie-Censorship.com. http://www.movie-censorship.com/report.php?ID=179730. pristupljeno 22. kolovoza 2011..
↑ "Walking Dead, The (Comparison: European Version (e.g. UK BD) – US Version)". Movie-Censorship.com. http://www.movie-censorship.com/report.php?ID=828387. pristupljeno 1. kolovoza 2011..
↑ "The Walking Dead - Die komplette erste Staffel (Special Uncut Version) (The Walking Dead - The complete first season (Special Uncut version)" (german). http://www.amazon.de/The-Walking-Dead-komplette-Staffel/dp/B00C3ZO6PA/. ↑ Lacey, Gord (30. svibnja 2012.). "The Walking Dead - '2nd Season' Press Release: Trailer, Final Details, Art for DVD, Blu-ray, Limited BD". TVShowsOnDVD.com. http://www.tvshowsondvd.com/news/Walking-Dead-Season-2/17018. pristupljeno 29. kolovoza 2013..
↑ Miller III, Randy (25. kolovoza 2013.). "The Walking Dead: Season Three [Limited Edition Aquarium Tank (Blu-ray)"]. DVD Talk. http://www.dvdtalk.com/reviews/61516/walking-dead-season-three-limited-edition-aquarium-tank-the/. pristupljeno 29. kolovoza 2013..
↑ Lambert, David (24. lipnja 2014.). "The Walking Dead - Anchor Bay's Official Press Release for 'The Complete 4th Season'". TVShowsOnDVD.com. http://www.tvshowsondvd.com/news/Walking-Dead-Season-4/19965. pristupljeno 3. siječnja 2015..
↑ "The Walking Dead: Season 1 (2010)". Rotten Tomatoes. http://www.rottentomatoes.com/tv/the-walking-dead/s01/. pristupljeno 4. listopada 2013..
↑ Havrilesky, Heather. "Don't miss these 9 new TV shows". Salon. http://www.salon.com/2010/09/21/tv_fall_preview_slideshow/slide_show/1. pristupljeno 24. listopada 2010..
↑ "The Walking Dead: Season 2 (2011-2012)". Rotten Tomatoes. http://www.rottentomatoes.com/tv/the-walking-dead/s02/. pristupljeno 4. listopada 2013..
↑ Tucker, Ken (28. studenog 2011.). "'The Walking Dead' and 'Pretty Much Dead Already': A cheap thrill-kill, or new life for the season?". Entertainment Weekly. http://watching-tv.ew.com/2011/11/28/walking-dead-season-2-episode-7-sophia/. pristupljeno 9. veljače 2012..
↑ Rawlings, Nate (28. stuednog 2011.). "Walking Dead Recap: Pretty Much Dead Already". Time. http://entertainment.time.com/2011/11/28/walking-dead-recap-pretty-much-dead-already/. pristupljeno 12. veljače 2012..
↑ Wampler, Scott (18. ožujka 2012.). "THE WALKING DEAD Season Finale Recap: "Beside the Dying Fire"". Collider.com. http://collider.com/the-walking-dead-season-2-finale-recap/153259/. pristupljeno 11. listopada 2012..
↑ Yeoman, Kevin (19. ožujka 2012.). "‘The Walking Dead’ Season 2 Finale Review". Screen Rant. http://screenrant.com/the-walking-dead-season-2-finale-review-yman-159873/. pristupljeno 10. veljače 2012..
↑ "The Walking Dead: Season 3 (2012-2013)". Rotten Tomatoes. http://www.rottentomatoes.com/tv/the-walking-dead/s03/. pristupljeno 4. listopada 2013..
↑ "The Walking Dead: Season 3". Metacritic. http://www.metacritic.com/tv/the-walking-dead/season-3. pristupljeno 11. listopada 2012..
↑ Gay, Verne (11. listopada 2012.). "'The Walking Dead' season 3 doesn't disappoint". Newsday. http://www.newsday.com/entertainment/tv/the-walking-dead-season-3-doesn-t-disappoint-1.4098712. pristupljeno 11. listopada 2012..
↑ "The Walking Dead: Season 4 (2013)". Rotten Tomatoes. http://www.rottentomatoes.com/tv/the-walking-dead/s04/. pristupljeno 10. prosinca 2013..
↑ "The Walking Dead : Season 4". Metacritic. http://www.metacritic.com/tv/the-walking-dead/season-4. pristupljeno 3. listopada 2014..
↑ "The Walking Dead: Season 5 (2014)". Rotten Tomatoes. http://www.rottentomatoes.com/tv/the-walking-dead/s05/. pristupljeno 22. siječnja 2015..
↑ "The Walking Dead : Season 5". Metacritic. http://www.metacritic.com/tv/the-walking-dead/season-5. pristupljeno 22. siječnja 2015..
↑ Seidman, Robert (2. studenog 2010.). "Sunday Cable Ratings: The Walking Dead Kills; Boardwalk Empire Steady; + Swamp People, Dexter, Ghost Hunters Live & Much More". TV by the Numbers. http://tvbythenumbers.zap2it.com/2010/11/02/sunday-cable-ratings-the-walking-dead-kills-boardwalk-empire-steady-swamp-people-dexter-ghost-hunters-live-much-more/70585. pristupljeno 3. studenog 2010..
↑ Gorman, Bill (7. prosinca 2010.). "Sunday Cable Ratings: 'The Walking Dead,' 'Boardwalk Empire' Finales Rise; 'Sarah Palin's Alaska,' 'Dexter,' 'The Hasslehoffs' & More". TV by the Numbers. http://tvbythenumbers.zap2it.com/2010/12/07/sunday-cable-ratings-the-walking-dead-boardwalk-empire-finales-rise-sarah-palins-alaska-dexter-the-hasslehoffs-more/74601. pristupljeno 8. prosinca 2010..
↑ "2010 Year in Review/2011 Year in Preview: AMC". The Futon Critic. 24. siječnja 2011.. http://www.thefutoncritic.com/news/2011/01/24/2010-year-in-review-2011-year-in-preview-amc-558111/9082/. pristupljeno 25. ožujka 2012..
↑ Seidman, Robert (18. listopada 2011.). "Sunday Cable Ratings: 'The Walking Dead' Doubles NLCS + NJ Housewives, 'Boardwalk Empire,' 'Talking Dead,' 'Dexter' & Much More". TV by the Numbers. http://tvbythenumbers.zap2it.com/2011/10/18/sunday-cable-ratings-the-walking-dead-doubles-nlcs-nj-housewives-boardwalk-empire-talking-dead-dexter-much-more/107500/. pristupljeno 18. listopada 2011..
↑ Bibel, Sara (20. ožujka 2012.). "Sunday Cable Ratings: 'Walking Dead' Season Finale Laps the Field + 'Khloe & Lamar,' 'Frozen Planet,' 'Army Wives' & More". TV by the Numbers. http://tvbythenumbers.zap2it.com/2012/03/20/sunday-cable-ratings-walking-dead-season-finale-laps-the-field-khloe-lamar-frozen-planet-army-wives-more/125028/. pristupljeno 20. ožujka 2012..
↑ Harnick, Chris (19. ožujka 2012.). "'The Walking Dead' Ratings: Season 2 Finale Shatters Records". The Huffington Post. http://www.huffingtonpost.com/2012/03/19/the-walking-dead-ratings-season-2-finale_n_1365010.html. pristupljeno 23. listopada 2012..
↑ Bibel, Sara (16. listopada 2012.). "Sunday Cable Ratings:'The Walking Dead' Dominates Night, Space Jump, 'Dexter', 'Boardwalk Empire','Homeland,' 'Breaking Amish', & More". TV by the Numbers. http://tvbythenumbers.zap2it.com/2012/10/16/sunday-cable-ratingsthe-walking-dead-dominates-night-space-jump-dexter-boardwalk-empirehomeland-breaking-amish-more/153061/. pristupljeno 16. listopada 2012..
↑ Hibberd, James (1. travnja 2013.). "'Walking Dead' finale breaks series records". Entertainment Weekly. http://insidetv.ew.com/2013/04/01/walking-dead-finale-ratings-3/. pristupljeno 1. travnja 2013..
↑ "The Walking Dead: Season Three Ratings". TV Series Finale. 2. travnja 2013.. http://tvseriesfinale.com/tv-show/the-walking-dead-season-three-ratings-25309/. pristupljeno 4. prosinca 2013..
↑ Bibel, Sara (14. listopada 2013.). "'The Walking Dead' Season 4 Premiere is Highest Rated Episode Ever With 16.1 Million Viewers & 10.4 Million Adults 18-49". TV by the Numbers. http://tvbythenumbers.zap2it.com/2013/10/14/the-walking-dead-season-4-premiere-is-highest-rated-episode-ever-with-16-1-million-viewers-10-4-million-adults-18-49/208857/. pristupljeno 14. listopada 2013..
↑ Bibel, Sara (1. travnja 2014.). "Sunday Cable Ratings: 'The Walking Dead' Wins Night, 'Talking Dead', 'Real Housewives of Atlanta', 'Shameless', Naked and Afraid' & More". TV by the Numbers. http://tvbythenumbers.zap2it.com/2014/04/01/sunday-cable-ratings-the-walking-dead-wins-night-talking-dead-real-housewives-of-atlanta-shameless-naked-and-afraid-more/249656/. pristupljeno 1. travnja 2014..
↑ Bibel, Sara (31. ožujka 2014.). "'The Walking Dead' Season 4 Finale Delivers 15.7 Million Viewers & 10.2 Million Adults 18-49, A Season Finale Record". TV by the Numbers. http://tvbythenumbers.zap2it.com/2014/03/31/the-walking-dead-season-4-finale-delivers-15-7-million-viewers-10-2-million-adults-18-49/249361/. pristupljeno 31. ožujka 2014..
↑ Bibel, Sara (31. ožujka 2015.). "Sunday Cable Ratings: 'The Walking Dead' Tops Night, 'Talking Dead', 'Real Housewives of Atlanta', 'Going Clear', 'Killing Jesus' & More". TV by the Numbers. http://tvbythenumbers.zap2it.com/2015/03/31/sunday-cable-ratings-the-walking-dead-tops-night-talking-dead-real-housewives-of-atlanta-going-clear-killing-jesus-more/382018/. pristupljeno 31. ožujka 2015..
↑ Bibel, Sara (30. ožujka 2015.). "'The Walking Dead' Season 5 Finale is Highest Rated Finale in Series History, Garnering 15.8 Million Viewers". TV by the Numbers. http://tvbythenumbers.zap2it.com/2015/03/30/the-walking-dead-season-5-finale-is-highest-rated-finale-in-series-history-garnering-15-8-million-viewers/381342/. pristupljeno 30. ožujka 2015..
↑ "AFI Awards". AFI.com. http://www.afi.com/afiawards/default.aspx. pristupljeno 13. prosinca 2010..
↑ "'Inception,' 'Walking Dead' Top Saturn Awards Nominations". The Hollywood Reporter. 24. veljače 2011.. http://www.hollywoodreporter.com/news/inception-walking-dead-top-saturn-160979?page=3. pristupljeno 24. veljače 2011..
↑ Ausiello, Michael (6. lipnja 2011.). "Mad Men, Fringe, Good Wife, Modern Family, Community, Justified Lead Critics Choice Kudos". TVLine. http://www.tvline.com/2011/06/mad-men-fringe-modern-family-community-critics-choice-awards/. pristupljeno 8. lipnja 2011..
↑ "Emmy Nominations 2011: Full List". The Hollywood Reporter. 14. srpnja 2011.. http://www.hollywoodreporter.com/news/emmy-nominations-2011-full-list-211331?page=2/. pristupljeno 14. srpnja 2011..
↑ "2011 Primetime Creative Arts Emmy Awards Winners". The Academy of Television Arts & Sciences. 10. rujna 2011.. http://www.thefutoncritic.com/news/2011/09/10/2011-primetime-creative-arts-emmy-awards-winners-425324/20110910atas01/. pristupljeno 19. rujna 2011..
Ova stranica je zadnji put izmijenjena 23:14, 22 februar 2019.